They’ve done it again. 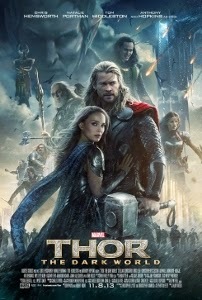 I’m happy to report that Marvel’s first Thor sequel, subtitled The Dark World, is a full-throttle blast of awesomeness that makes up for the disappointing Phase Two kick-off, Iron Man 3. The Dark World steps everything up, feeling not only like a genuine sequel to the first Thor, but also like a bridge between The Avengers and whatever comes next. That was a big misstep made in the third Iron Man outing, which was such an isolated Tony Stark solo adventure (save for a few tacked-on references to Tony’s supposed PTSD) that it could’ve easily come out prior to Joss Whedon’s epic with few alterations. Much of this connection is due to the presence of Loki (Tom Hiddleston), the villain of both Thor and The Avengers. Here he’s been sentenced by Odin (Anthony Hopkins) to a lengthy stay in the Dungeon, found guilty of unpardonable crimes against the people of Earth. Thor (Chris Hemsworth) has not forgiven him either, though he clearly harbors hope that his brother will seek some form of redemption. Also connecting directly to Avengers, back on earth Dr. Erik Selvig (Stellan Skarsgård) has been driven bonkers by his temporary possession during the earlier film. Erik, along with Jane Foster (Natalie Portman) and her intern, Darcy (Kat Dennings), are investigating a bizarre, inter-dimensional portal that has been discovered in London. The portal is a sign of what we learn is an impending convergence that will align the nine realms, including Earth and Asgard. 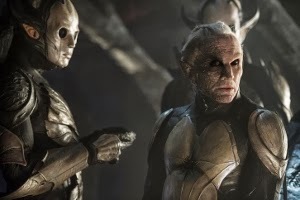 As for bad guys The Dark World boasts a truly malevolent presence in the form of Malekith (Christopher Eccleston), leader of the Dark Elves of Svartalfheim. We learn all about Malekith in a somewhat jumbled pre-credits sequence narrated by Odin, whose father Bor supposedly defeated the Dark Elf. The fact that Odin retells part of the same story later in the film suggests that director Alan Taylor and his trio of screenwriters weren’t sure how to clearly communicate their villain’s backstory. Suffice it to say, having failed to permanently darken the universe using an insidious substance called Aether, Malekith is back for another go around when Jane unwittingly unlocks long-dormant Aether in London. It’s not merely the Earth’s well-being that is at stake in The Dark World – it’s the entire universe. If anything’s wrong with the film, it’s a case of too much plot, a lot of exposition (including a laundry list of hard-to-remember character and location names), and a lack of focus. But director Taylor (best known for his work on HBO’s Game of Thrones) juggles a surprising number of subplots just gracefully enough to keep the whole thing aloft. Far from being a Thor-only showcase, the supporting cast gets ample time to shine (with Hiddleston and Dennings stealing the majority of the scenes). The humor that was so prevalent in the first Thor is not only back, it’s more seamlessly integrated as we jump back and forth between Earth-bound adventure and galactic escapades. The multi-realm climactic battle perfectly executes this balance of excitement and humor. 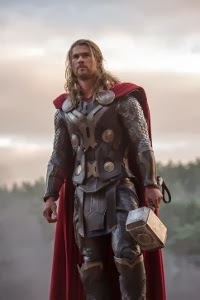 Thor: The Dark World is a better sequel than either the second or third Iron Man films. It capitalizes on this specific character’s inherent ability to transport us off Earth and into the world of sci-fi/fantasy. We only had hints of that in The Avengers, but this film serves as a huge step toward expanding the parameters of what we’ll be seeing in the Marvel Cinematic Universe. The Dark World furthers the evolving story Marvel is telling in a way that Iron Man 3 did not. The difference between the two can further be illustrated by comparing their post-credit bonus scenes. Whereas Iron Man 3 tacked on a cute but inconsequential joke, The Dark World’s first of two post-credit sequences (which actually occurs mid-credits, yes you’ll need to stay to the very end to see both) introduces us to a brand new character that we’ll be seeing more of next year. Thor: The Dark World functions as much more than an encore to the first film. It’s a great standalone adventure and I can’t wait to see it again.